My own purpose-built modelling bench. THE LUXURY! The luxury of it! I am finally gaining ground in the constant battle for territory in my own garage. It's a pitched battle, waging back and forth, with space as the prize. On one side, I have my son, the stuff he wants kept here in case he needs it one day, the bits of his car, things he might need one day when he has kids of his own, and my wife, and the things "we can't keep in the house! You have to find space for that somewhere in the garage", and the vast array of things we can't throw out "in case they come in handy". And on my side, there's ... well there's me. No wonder it's been a losing battle for so long. Anyway at Christmas time, I finally made progress. I got agreement from the Chairman of Finance to give me some materials for a new area in the garage for a Christmas present, and I set to. I cleared away 15 years of crap from the area, and cleaned it out. I had never done gyprock before (drywall to our American friends) so I had to learn how to do that. I found it to be nowhere near as difficult as I'd thought it would be. Rather fun in fact, because it made such rapid progress. Once the wall was lined, I put battens up with lag screws to hold the desktop. It's at chest height - much higher than the normal work bench because my eyesight isn't what it was and I like to have my model close so I can see it properly. I got this idea when I watched a jeweller at work in his workshop once. The worktop is 18mm MDF with a hardboard top, and a couple of coats of varnish. 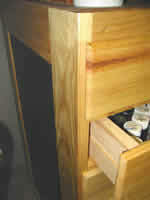 Then I set to making the drawers, which are to keep my modelling supplies and tools under control. While this was a side-trip from making models, it was extremely pleasurable. In woodwork, I've never made anything as complicated as a chest of drawers before, and I found it to be very satisfying. I have lots of ideas for other things to make for this workstation - racks, shelves, cupboards etc to keep my modelling activities organised, and have everything at hand. This making sawdust is good fun. 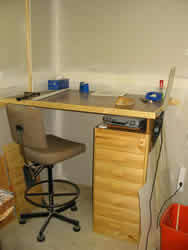 Click the picture to see the workstation closer up and some of the ideas I have for improving the workspace. Now, back to building model warships. Have your say ... add your comments to this article. Do you agree or disagree? Scroll down to read the comments.